In Statistics for Business: Decision Making and Analysis, authors Robert Stine and Dean Foster of the University of Pennsylvania’s Wharton School, take a sophisticated approach to teaching statistics in the context of making good business decisions. 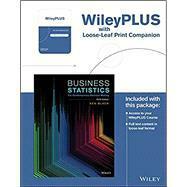 Business Statistics: For Contemporary Decision Making, 7th Edition by Ken Black Stay ahead with the world's most comprehensive technology and business learning platform. With Safari, you learn the way you learn best.